Three unique ancient statues from the third century A.D. have been discovered during archaeological excavations in Turkey's southwestern Antalya province, Culture and Tourism Ministry said Saturday. The discovery follows the discovery of three other statues found by archaeologists in the ancient city of Side located in Antalya's Manavgat district. According to a statement by the ministry, the artifacts were immediately taken under preservation for further research. Two of the statues discovered in Side are males while the other one is a female and all of them are dressed. Experts believe the statues represented senior civil servants in the Roman Empire. Furthermore, archaeologists are researching why the statues, which were supposed to be standing upright inside the niches were found lying on the ground. In this regard, researchers note that during renovations of the southern portico of the structure [referred to as the M building] in the fourth century A.D., the Romans could have used the statues but re-sculpted the head part and came up with new portraits. The excavations at Side are conducted in cooperation with the Culture and Tourism Ministry and Anadolu University [represented by Professor H. Sabri Alanyalı]. 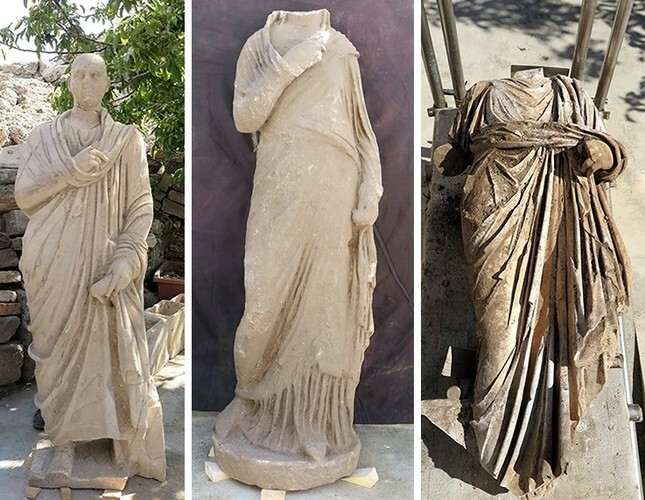 Professor Alanyalı told Ihlas News Agency that the practice of re-sculpting the heads of old statues was a common practice in the late Roman Empire as a result of economic crisis during the period. The ancient city of Side is located on the eastern part of Pamphylian coast, and was founded by ancient Greek settlers. Well-preserved city walls, a theatre, temples and are among many structures that are visited by hundreds of thousands of tourists every year.